“I found it hard to get a rhythm from the go,” said the Irish track star who has struggled with injury this summer. 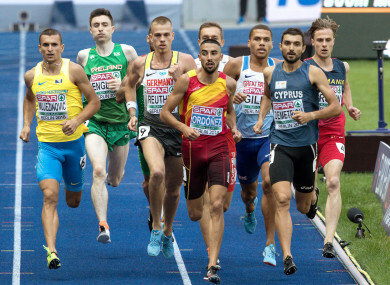 DONEGAL’S MARK ENGLISH, winner of a European bronze medal in this event in 2014, was eliminated in the 800m heats in Berlin today. The 25-year-old managed to run a season’s best time of 1:48.98. However, four seconds off his personal best over the two-lap event, it was only good enough to take him across the line eighth – though he was bumped up to sixth as two rivals were handed DQs. With the slowest qualifiers crossing the line in the low 1:48s, Ireland’s Zak Curran was also unable to progress with his time of 1:49.31 in heat 3. “Things just didn’t click the way I way I wanted them to, but sometimes that’s the way it goes,” a dejected English told RTÉ as he faced into a watching brief for the rest of the Championships. Email “Season's best for Mark English not enough to advance from 800m heats”. Feedback on “Season's best for Mark English not enough to advance from 800m heats”.